Builders have reached the top floor of The Star’s Gold Coast multi-million dollar revamp. 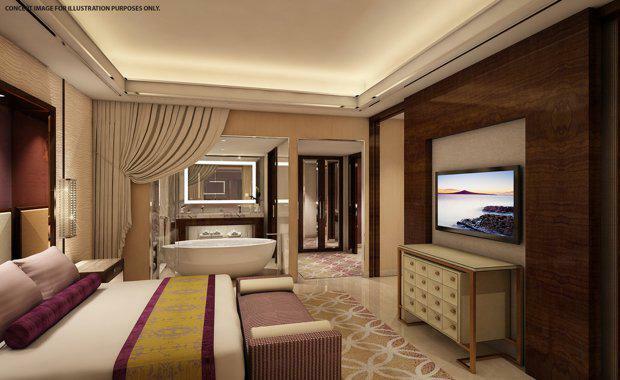 The 17-storey, DBI-designed hotel will feature more than 50 luxury suites from 68 to 300 square metres in size. 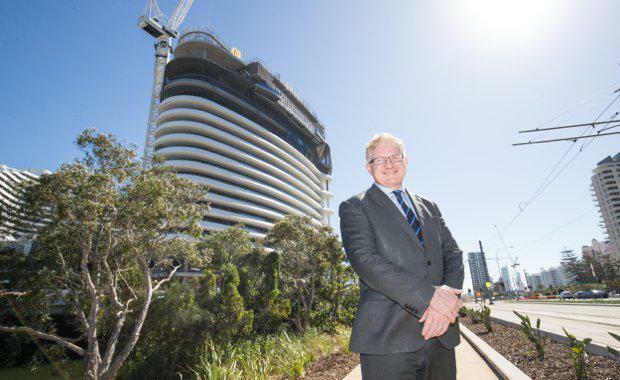 The Star Entertainment Group’s Managing Director Queensland Geoff Hogg said the number of tradespeople onsite was expected to peak at more than 500 later this year as the finishing touches are made to the Gold Coast’s first six-star offering in more than a decade. “Approximately 350 tradespeople have contributed to the completion of the tower, which has progressed at a rate of approximately one storey every fortnight,” Mr Hogg said. “The procurement of highly skilled tradespeople has been a strong focus for the project and has served to provide a significant boost for the local economy. Custom-created Glass Fibre Reinforced Concrete (GRC) bands, crafted using three-dimensional computer modelling, form the unique curve of the 17-storey structure. On average, 34 individual panels make up each floor, while up to 70 panels will be required to complete the larger lower levels and more intricate upper floors. On the top floor, cantilevered steel perched 67 metres above ground forms the basis of a gravity-defying infinity edge pool that extends five metres beyond the side of the tower. Each of the pool’s five prefabricated sections, weighing between 12 and 13.5 tonne, were built over a two-week period before being carefully lifted and secured into place. The floating structure is able to support up to 500 tonnes of concrete and water, and will provide views of the Gold Coast skyline. A new bridge, which meets the existing Gold Coast Highway and Elizabeth Avenue intersection, will form the main access point to the six-star hotel and create a third access point to the island. With the external structure nearing completion, the external man hoist has been dismantled and internal lifts made operational to allow internal trades to execute the fit-out of the luxury hotel. The world-class addition will offer new signature bars and restaurants, private gaming rooms and true six-star service to assist in driving broader domestic and international appeal. The six-star tower forms part of The Star Gold Coast’s current transformation which includes the refurbishment of the property’s existing facilities ahead of the 2018 Commonwealth Games. Subject to successful apartment pre-sales, an additional hotel and apartment tower as part of a joint venture with Hong Kong-based partners Chow Tai Fook and Far East Consortium, takes the property’s total transformation to a combined investment worth up to $850 million.